WE DESIGN, DEVELOP & MAINTAIN LEADING EDGE WEBSITES FOR BUSINESS. TO DEVELOP A BRANDED WEBSITE FOR BUSINESS TAKES MORE THAN JUST PROGRAMMERS. It takes marketing intelligence; a deep understanding of business and how it works; experience in brand and marketing communications; and breakout creative backed by leading-edge web technology. We create branded websites that are frontline strategy against the competition. Click the image to the left to see our Website Design Interface and enter this password, “upsc”. This is our prototyping tool for client collaboration from rough wireframes through finished design. With fully interactive capabilities showing all linking in the design phase. This makes the process quicker, more cost-effective and puts all design reviews and approvals online where they belong. We use “Agile” methodology—the industry standard development process—to manage web development so we can deliver concept-to-market websites in an efficient and timely manner. This method allows you to oversee development, give feedback early and often. OUR APPROACH TO WEB DEVELOPMENT HANDLES ISSUES BEFORE THEY BECOME ISSUES. 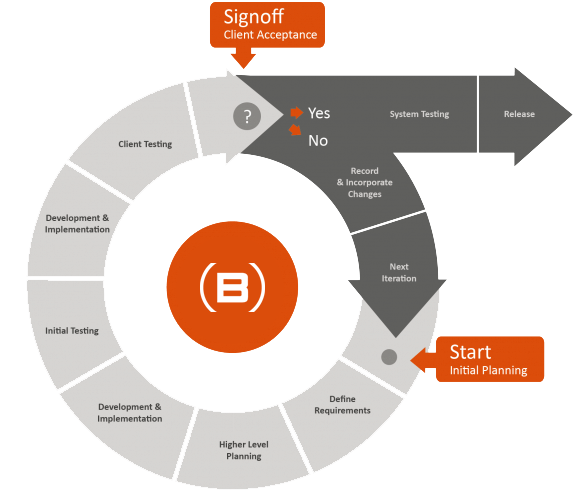 The initial meeting is an important part of our development process. We are skilled at asking the right questions and getting to the right information needed to create breakout websites. To begin developing your new website, we research your stakeholders, market and target audience utilizing our proprietary “Strategic Tool Kit.” This allows us to build strategies that will help engage, capture, and convert. Wireframes are low-fidelity sketches of the website. They are used to create placeholders for content, establish priorities for elements on the page, and to document requirements. We collaborate with you to structure your website in the most effective way and this helps determine what features are most important for your website, what goals each group of users have, and what the most beneficial user experience would be. 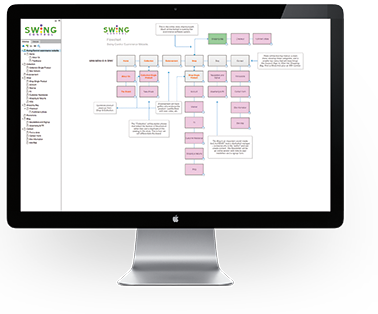 A site map and flow chart are visual organized models of a website’s content. It is an interactive table of contents in which each listed item links directly to its counterpart sections of the website. Just as function monitors structure; content precedes design. Copywriting for the web is challenging: the content must be brief, easy to scan and engaging. It should also utilize keywords that are important for the business to aid with SEO. From creative development to information architecture, user experience and final mockups, our design process encompasses the full development lifecycle. We ensure your website will work flawlessly on all platforms and devices using responsive web design, meaning your site will automatically fit any screen size whether users access it via a smartphone, PC or tablet. Every web project is a custom-tailored solution. But we understand that leveraging existing technologies is important, so will help you seamlessly integrate a wide variety of web and server-based software into your site depending on your needs. Our team lead will work with you to plan and provide a staging environment where you can monitor and approve each step of the ever evolving website. A prototype is an early-stage, interactive preview of the website in a browser. We use it to improve functionality, page load times and search engine visibility—all in an effort to ensure a smooth user experience. We also implement Google Analytics on every site we build to track performance and recommend improvements over time. All our websites are “responsive.” Think of responsive web design as a way to make your web content available to all emerging mobile devices through a single website. This includes additional steps at code level design to identify how the content should be served on desktops, tablets, and smartphones. WE EMPLOY COMPLEX TECHNOLOGY WITH ONE GOAL IN MIND. SIMPLICITY. Web programming can be done in dozens of ways. We utilize leading edge standards. Select a technology below see how we use a smart strategy that gives a competitive edge to our clients. DoubleClick is a subsidiary of Google which develops and provides Internet ad serving services and is the premiere digital advertising ecosystem today. DoubleClick Digital Marketing is an integrated ad-technology platform that enables us to more effectively create, manage and grow high-impact digital marketing campaigns. It integrates world-class solutions to help run holistic campaigns across multiple channels, and streamlines workflow for planning, trafficking, targeting, serving, optimisation and reporting. At BLAIRCOMM we are WordPress experts. WordPress is an online, open source website creation tool written in PHP—the programming language of choice for web development. It is arguably most powerful and fastest growing website Content Management System (or CMS) in existence today and is fully supported worldwide. WordPress is the most cost effective CMS available for companies of any size. It is “Open Source” and there is no financial commitment, yet it functions like a custom programmed CMS. The intuitive user interface allows clients to manage their own websites, but is capable enought for advanced IT team customization. It is easy to maintain and update. The platform is supported by advanced programmers at WordPress.org providing a state-of-the-art IT team free of charge. The technology is robust and used worldwide. This means it is a commercially viable platform business can rely on. There are milions of users worldwide keeping WordPress a constantly updated platfrom that is here to stay. It utilizes industry standard, advanced web technologies and there is knowledgable technical support readily available. There are add-ons and custom modules that provide nearly any function desired plug and play at a fraction of the cost of custom programming. WordPress supports one of the most widely used ecommerce platforms on the web: WooCommerce. It is secure enough for any applicaion across industries. It supports multi-website management and/or intranet management. WooCommerce powers over 28% of all online stores and is now the most popular eCommerce platform on the web. It is also the most customizable eCommerce platform for building your online business. As most know, HTML (HyperText Markup Language) is the most basic building block of the Web. It describes and defines the content of a web page. 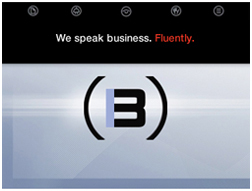 As with most languages, there are many ways to use it—but ony a few really optimum ways. We have spent years developing a smart way to create with HTML. CSS is a language that describes the style of an HTML document. CSS stands for Cascading Style Sheets. It describes how HTML elements are to be displayed on screen and saves a lot of work and money. It can control the layout of multiple web pages all at once and can be written in many ways to achieve the same effect. Some however have hidden pitfalls that affect a website badly. PHP is a widely-used open source scripting language that is especially suited for web development and can be embedded into HTML. It is the most popular scripting language on the web and used to enhance web pages giving them functionality for a dynamic user experience. We utilize PHP to its full extent using the best current practices in conformation with web standards. A website wireframe is a visual guide that represents the framework of a website. Wireframes are created to arrange elements for a particular purpose and to see how the finished website will look and function before developing it. Today, a wireframe must not only show design, but functionality and interactivity. We utilize a wireframing, rapid prototyping, documentation and specification software tool to create realistic wireframes that clients can access and test online before actual web development begins. It is our prototyping tool for client collaboration from rough wireframes through finished design. With fully interactive capabilities showing all linking in the design phase. This makes the process quicker, more cost-effective and puts all design reviews and approvals online where they belong. GIT is the most widely used modern version control system in the world today. Version control software allows you to have many versions of a project showing the changes that were made to the code over time, and allows you to backtrack if necessary and undo those changes. This ability alone – of being able to compare two versions or reverse changes, makes it fairly invaluable when working on larger projects. It is used in creating a prototype of the finished website, can be worked on by many people at once, and accessed by the client’s IT team for collaboration. GIT mirrors the entire version history. Each developer always has a complete copy of everything. A central server is still used, but should the worst happen, then everything can still be restored from any of the stake holders who have the latest versions. Think of it as security in the midst of chaos. Software-as-a-service, or SaaS, are content management systems with integrated website builders, blogging platforms, hosting services and domain name registrars. The systems allow businesses to create and maintain websites, online stores and blogs, but must be hosted by the provider based on a monthly fee and businesses cannot host their own websites. Additionally, the website assets are also hosted by the provider and are not entirely under the control of the business. While there are disadvantages, some business wish to utilize these services for the simplicity. We can develop on several of these platforms to provide a custom, branded website to thoise clients who want to go that route. 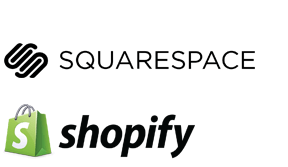 Squarespce and Shopify are two of the ones we can work with.